Pizza! Yeah, it’s something to get excited about especially at our house. Especially home-made. Coz where I live, it’s hard to get great great pizza and and the good places always seem to have a line and a long wait. Heck, even the mediocre places do. And delivery? C’mon. I’m in a weird area by a lake and my options are limited. I know I’m not alone in this. If you live in small town America, like my folks, well, your options can be even more limited. And I can’t tell you how many times we’ve waited and waited and waited for the delivery person, only to get luke-warm pizza with soggy crust. *sighs* No one likes a soggy bottom. I’ve tried all kinds of methods and recipes for all types of pizza, but this pizza dough and method of baking, courtesy of Tyler Florence has kind of transformed my life. That’s a bold statement, I know, but I find myself turning to it all the time. We seriously love this pizza dough. The crust, using Tyler’s method is a beautiful thing. Soft and doughy and fragrant with yeast – but the bottom has a nice crunchy crispiness. You don’t get that with most delivery pizzas. And you can probably make this in the time it takes one to come to your door – 30 minutes or less, my patootie. You’ll have this done in an hour and a half, tops and an hour of that is sitting around waiting for the dough to rise. .
Tyler Florences Pizza – look how gorgeous that crust turns out! This dough is very easy to work with – use a larger pan, like a 1/4 sheet pan for a thinner crust, a smaller pan for thicker. My old, blackened sheet pan (the one I use to catch drips in the oven and that I’m usually embarrased when people see it) works beautifully. I stretch the dough on my counter while the pan is preheating. And talk about a huge markup – pizza’s one of the worst offenders. So darned cheap to make at home and so pricey when it’s made for you. Best of all, pizza just lends itself to a bit of this, a bit of that, so at my house, I use leftovers all the time. Here’s two of our faves using Thanksgiving turkey, a Barbecue Turkey Pizza and a Turkey and Artichoke Pizza. 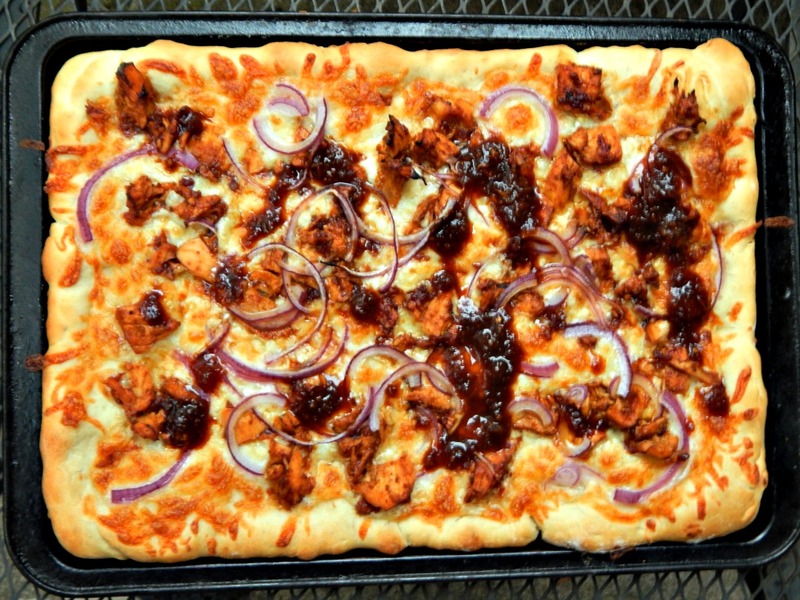 Tyler Florences Pizza – this one is Barbecue made with leftovers…why not drizzle a little extra sauce over the top!! Prepare your dough, preheat pan as directed, place dough in pan. Mix your turkey with the BBQ sauce, or if using pulled pork and it’s not already mixed with sauce, do the same. Spread the mozzarella over the dough. Sprinkle the red onion across the pizza. Sprinkle the turkey or pulled pork over the pizza. Bake 15 to 18 minutes until the top is cooked to your liking and the bottom is golden and crisp. If desired, sprinkle with cilantro and/or more barbecue sauce. Note: there is no actual pizza sauce so the more cheese, the better. Scatter tomatoes over the pizza dough. Add the rest of the toppings. If you’re using a stand mixer, combine the salt and flour to the bowl and pulse a few times to mix. Add the yeast mixture, at the lowest speed, until the flour incorporates. When the dough starts to come together, increase the speed to medium and mix until the dough gathers into a ball. This should take about 2 minutes. Add the olive oil and pulse a few more times. Stop the machine periodically to scrape the dough off the hook. Get a feel for the dough as you’re making it by squeezing a small amount together between your thumb and fingers. If it’s crumbly, add more water, if it’s sticky, add more flour, 1 tablespoon at a time. Turn the dough out onto a lightly floured surface and fold it over itself a few times, kneading until it’s smooth and elastic. If you’re making the dough by hand, add the yeast mixture to a large bowl and stir in the salt and the 2 tablespoons of olive oil. Then begin stirring in the flour. When the mixture becomes too stiff to stir with a spoon, knead in the rest of the flour by hand, adding just enough so that the dough is soft but not too sticky. As you work, squeeze a small amount of dough together between your thumb and fingers. If it’s crumbly, add more water; if it’s sticky add more flour, 1 tablespoon at a time. Knead until smooth and elastic, about 10 minutes. Take the preheated pan out of the oven and drizzle some olive oil over the entire surface. Cut the dough into 2 pieces and reserve 1 piece for another use. Stretch the pizza dough out so it is just bigger than the pan, then lay it inside the pan, so the dough comes up the sides to form a crust on the rim. Add your favorite toppings, bake in the hot oven until golden and bubbly, about 15 to 18 minutes. If I’m not serving a crowd, I freeze one of the crusts. When I’m ready to use, I’ll take it out and put it in the fridge the night before. Sometimes I’ll make the crust ahead and put it in a Ziploc in the fridge for the next day. Dinner’s a snap to throw together, then, and the crust tastes even better. Just one more, seemingly random Pizza, made from Leftovers! Smoked Sausage and Sauerkraut with Ricotta Cheese! This entry was posted in Click here for Bargain Meals, Click here for Fabulous Food Posts and tagged Artichokes, Barbecue, Chicken, Frugal Hausfrau, leftover Chicken, Leftovers, Pizza, planned leftovers, Pulled Pork, Turkey, Turkey Leftovers, Tyler Florence. Bookmark the permalink.